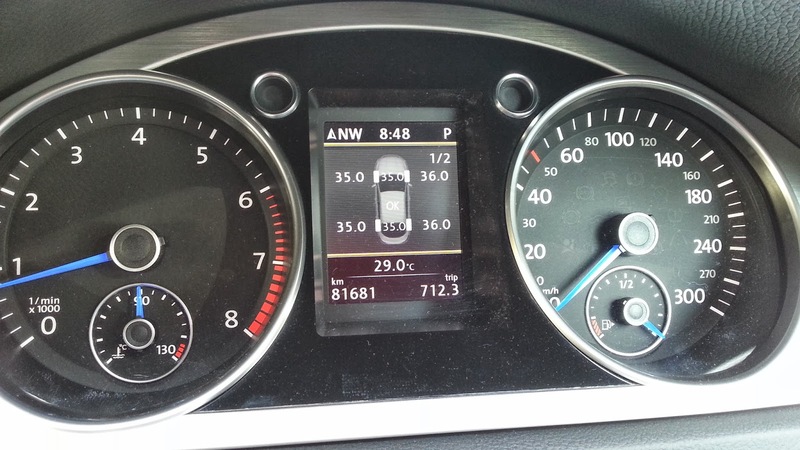 Today my retrofitted original VW Tire Pressure Monitoring System "pinged" whilst I was driving up North. 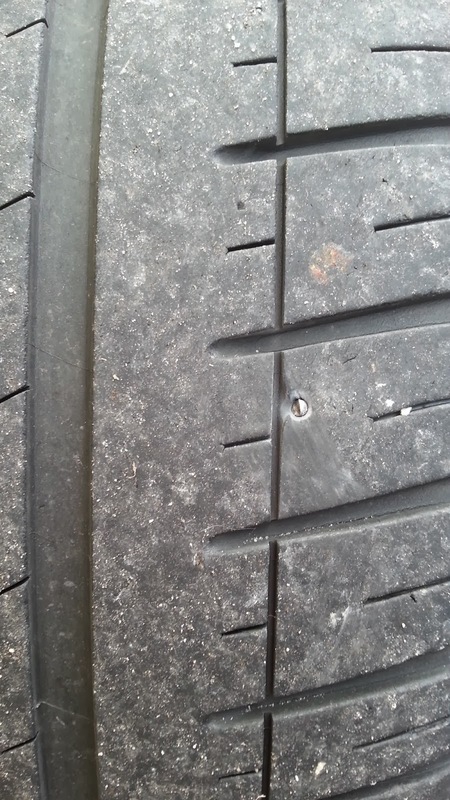 One tire was way below the limit preset in the system. It read 26 psi while the rest are within the 35psi limit preset. 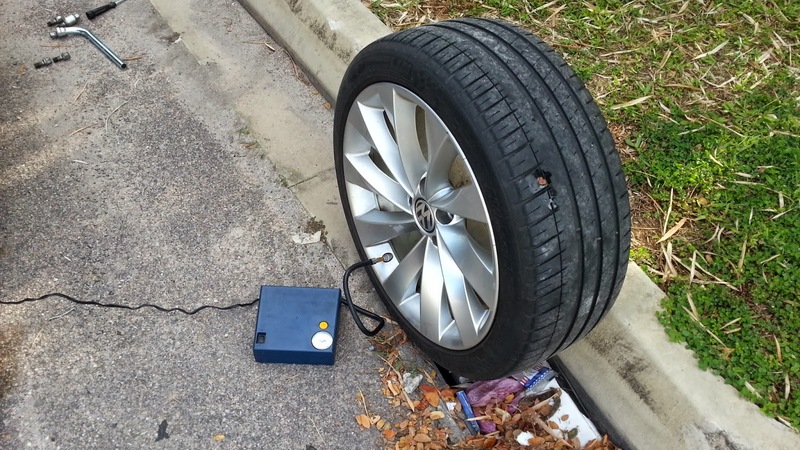 The earlier installed Tire Deflation Monitoring System installed earlier also sound the alarm. 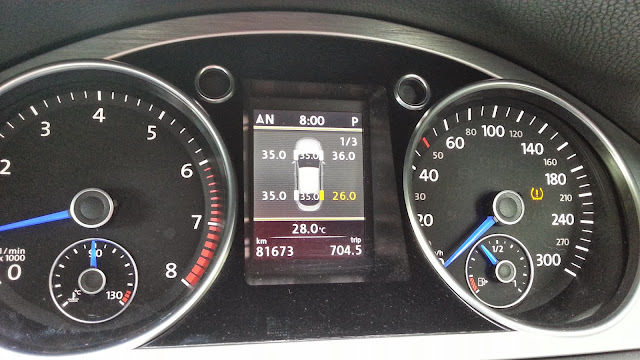 It has measured that one wheel was rotating faster than the others and triggered the Malfunction Light on the cluster. This is what I would call double security ! As I have still a distance to go before reaching my destination in Jalan Sentul KL, I pulled into the nearest township....and found a shady spot to check the rear right tire. 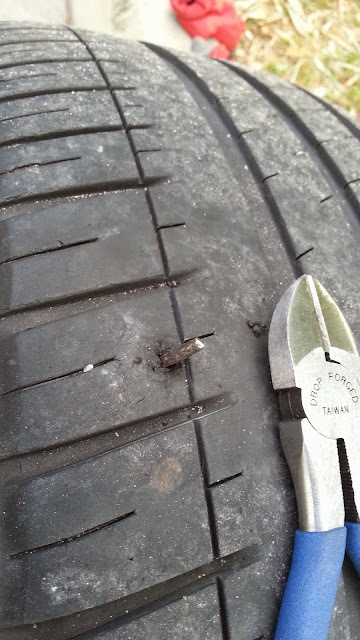 Removed the wheel and found that there was was indeed metal object embedded in the tire ! Can you notice the near hidden stud ? 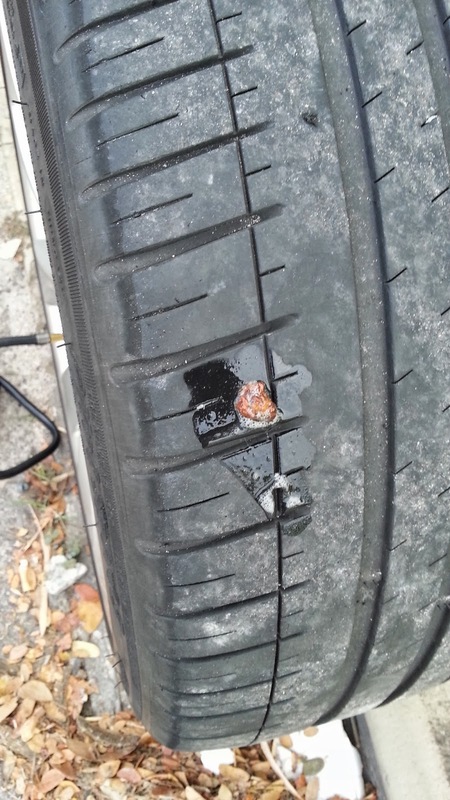 Had some difficulty trying to pry out the object not knowing what it is and at what angle it has penetrated the tire surface. 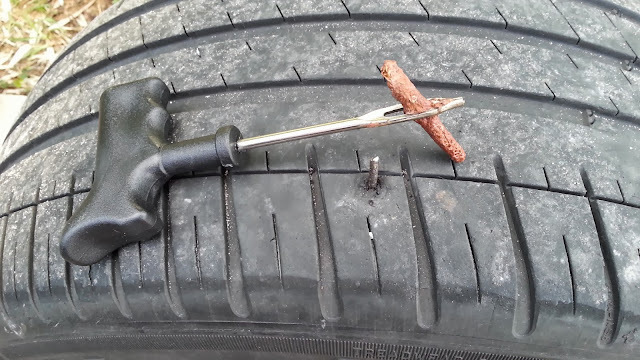 Later, found a plier cutter and used it to "dig" into the tire well into the body of the object and pulled it out. It was not actually easily pulled out but we managed to pull it out. It is important to know the angle of the penetration as inserting the rubber gummi stripe would need to be in the same position and angle so that the repair would be more effectively done. Pull out the nail and pushed in the surface prep tool so that the hole created can be enlarged and also the hole surfaces roughen out. Have to be forceful in the "poking" as it is enlarging the puncture hole and also pushing against all the steel braiding inside the tire. Turning the tool helps to roughen the surfaces. 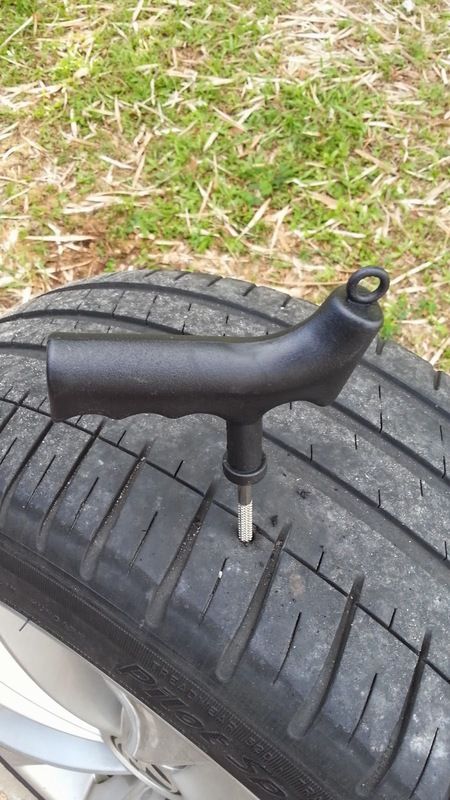 Here, the rubber gummi puncture repair stripe is show attached to the insertion tool. After the hole is prepared, the insertion tool is pushed into the hole following the same direction in a twisting/pushing manner. Believe me ! It is not just inserting it in as you need to exert a forceful push to get the whole stripe half down the hole. You MUST NOT over insert it all the way into the tire or else, it would be LOST inside ! Pushing it down halfway, you need to pull out the tool and the rubber gummi stripe would get stucked and as such, blocking and sealing up the hole ! That's the trick ! Here, the stripe is trimmed with the cutter and the good old fashioned saliva over the patch to see if there is still a leak......the saliva did not bubble so it is a perfect seal ! With the portable air pump, we inflated the tire ! And a perfect repair back on the road !